Growing up in the 1970s and ’80s, Cudahy-based author Christina Ward says she was raised in “the apex of the processed, packaged, pre-made food era.” Ward says the period between the 1950s and the ’80s was the heyday of mass consumerism and a period in which corporations utilized “psychological techniques and ruthless business practices” to strong-arm foods and beverages into the refrigerators and pantries of trusting households. As a direct result of these marketing practices that were unleashed upon a populace lacking in consumer savvy, American cookbooks of the time were bursting with culinary abominations, rancid recipes, and advertisements for products that are equally laughable and disgusting by today’s standards. 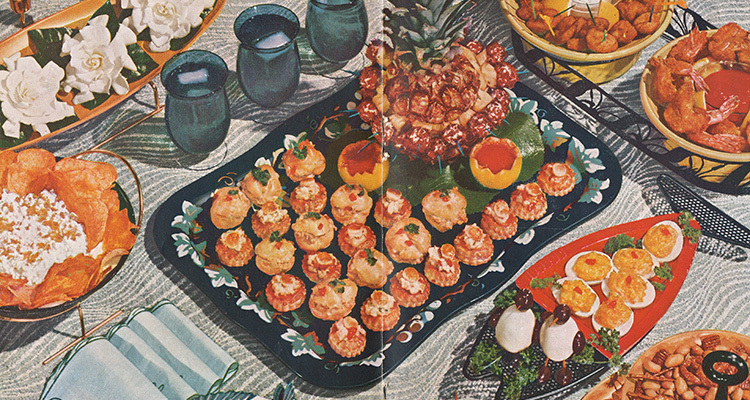 Ward combed through old cookbooks, aged periodicals, and vintage adverts and included many of them in her new book, American Advertising Cookbooks: How Corporations Taught Us To Love Spam, Bananas, And Jell-O. Before Ward’s author event at Boswell Book Company on Friday, February 1, we asked her about the corporate influence that drove consumers of yesteryear, how we’re marketed to today, why racism and broad stereotypes are still used to sell goods, and the reasons some pre-made products have stood the test of time. Milwaukee Record: In all your research and years of personal experience, what do you think is the strangest and least appetizing dish corporations have tried to thrust upon consumers? The “Terrine of Garden Vegetables” comes to mind for me. Christina Ward: I’m allergic to fish, so anything salmon-y or tuna-y puts me off more than any other thing. Add mayo and mold it into an anthropomorphic shape and that’s it, I’m retching. I’ll use my dad’s favorite phrase; it’s enough to gag a maggot. MR: Do you think the modern consumer is more savvy than people were between the 1950s and ‘80s, or has the internet just given people more options and, as a result, helped suss out some of the especially bad branding exercises? CW: We are savvier consumers. I remember learning about the types of persuasive arguments and how advertising uses them in grade school. It’s really not that long since the advent of modern psychology-driven techniques, really just a few generations since our great-grandparents and grandparents had to initially confront them. American culture values honesty and we’re, by our nature and upbringing, generally trusting. This made it much easier for marketers to exploit that aspect of our collective naivete. It took a couple of generations to learn advertising savvy. Today, the trend in ads is to engage in direct “signaling” to their desired consumers. You see this in marketing directed toward young men, lots of ironic jokes and silliness. I’m thinking of fast food brands that create “4/20” campaigns. It’s not that the ads are saying, “Hey, if you’re high, get some wings.” The brand is communicating its coolness by referencing the same tropes and memes favored by a group. The downside is that when a brand missteps, their failure is broadcast beyond their targeted base. When brands screw it up, it’s usually a case of bad taste, cultural insensitivity, or just plain old racism. MR: You point out a lot of instances of racism and the use of broad generalizations in the advertising of yesteryear. Can you think of ways that persists in the way foods and drinks are sold today? CW: The food industry in the United States rarely makes that kind of mistake today. Lord knows they made enough of them in prior years. I would argue that brands that use watered-down racist tropes are still inherently racist no matter how much they clean up the image. I’m thinking specifically of Aunt Jemima Pancake Mix and Uncle Ben’s Rice. There was Ashton Kutcher in brownface as a fake Bollywood caricature for PopChips in 2012. And then there was a “Kardashian Kerfuffle” earlier this year when Pepsi co-opted the very real social justice work down by Black Lives Matter activists and packaged it into a “Kendall Jenner brings racial harmony” Pepsi style ad. It was tone deaf and faced an immediate backlash. We’re getting better. MR: Do you think there’s anything today that we’ll look back on a collectively laugh at as a culture? Maybe the advent of energy drinks? Flavored vape? La Croix? Kale? Basically, what is today’s version of Flower Pot Sandwiches or instant milk mixed with gelatin? CW: I think there are many mockable foods today! Lunchables are indefensible. Can’t you toss a couple of crackers and a slice of bologna in a baggie? There are a few others on my list: Soylent-style meal shakes, all the “diet” foods, like Snackwell’s cakes. Recipe trend-wise, all these cauliflower-substituted pizzas, breads, and the like are ridiculous. So are spiralized vegetable noodles. I foresee a day when the question will be asked: Why did people pretend and disguise their food? If you want a cookie, eat a damn cookie. Just don’t eat a couple of dozen at once. Food marketing trends have always been rooted in cultural aspirations. The notion that we’ll be skinny if we drink the diet margarita or fat-free yogurt is crazy. But advertisers don’t care; they will sell you any number of processed foods with outlandish health claims based on spurious research. It’s worked for nearly a 100 years, why stop now? If anything, the lesson should be that the food processing conglomerates of the world are trying to sell you something. Is a potato chip delicious? Yes, it is. But, as a rule, humans are healthier animals if we eat foods with as little processing as possible. MR: I noticed the Milwaukee-made Settlement Cookbook made a cameo in your book. Are there any other Wisconsin-specific ad or recipe-related examples you found? Do any still exist today? CW: The Settlement Cookbook is a national treasure, and more Milwaukeeans should know its history. And of the more significant history of the other “settlement houses” in Milwaukee. In a nutshell, each immigrant neighborhood had a “settlement house” focused on specific groups to assist them in acclimating to their new country. These were funded by the wealthy industrialists in whose factories these immigrants worked. Even the snootiest of elites understood that education, access to fresh food, and exercise was the key to building healthy communities. Neighborhood House, Milwaukee Christian Center, and other community centers were born of the settlement house movement of the late 1800s. Advertising cookbooks originated from two distinct sources, a brand or an advocacy food council. The Kraut Packers Association produced beautifully cuckoo recipes and cookbooks from the 1940s to the 1970s. The headquarters was in Illinois, but the major sauerkraut producers are here in Wisconsin. As a Cudahy resident, I have a soft spot for the mystery meat ads produced by Patrick Cudahy and Cudahy Packing Company. MR: What’s the most surprising thing you learned while putting this book together? CW: One of the biggest takeaways is how bland American food is. From the early Puritan influence to the homogenization of packaged foods, most of what we eat is devoid of flavor and loaded up with the salty-fatty-sweet combination that makes the pleasure centers in our brains light up like fireworks. That at the earliest, food manufacturers’ goal was to get people to eat more. Our brains react to the salty-fatty-sweet combination of foods in the same area as opiates do. It creates a craving-deprivation response that encourages binge eating. Mind you, a relatively cheap and stable supply of fats, sugars, and salts are only about 100 years old. It’s why you died on the Oregon Trail. Human brains, in their earliest and most primitive functions, tell us to eat as many of these types of foods as we can when we are able. Our brains think those honey BBQ wings are a scarcity, so we snarffle them up. Processed foods, more than any other thing, are responsible for the modern obesity crisis. I think it would be good to remember that any time you see food advertising to keep in mind that these companies do not love you. MR: Canned tuna and pineapple are still on shelves everywhere. Jell-O seems to be killing it still and, unfortunately, Aunt Jemima remains a notable spokesperson. Why do you think some of these products you featured have stood the test of time while others fell to the wayside? I have to admit, I still love green bean casserole in all its soup company-marketed glory. CW: For every green bean casserole, there are dozens of recipes invented by the intrepid home economists in corporate test kitchens that didn’t catch on. It’s a bit like catching lightning in a bottle. The green bean casserole was aided by specific marketing around Thanksgiving, a very food-centric holiday. We’ve come to associate the dish as part of the celebration. I would ask: does anyone make that green bean casserole at any other time of the year? Probably not. That’s the ultimate goal of food advertising and the corporate cookbooks produced by so many companies; if they can get enough people to start using their product, it will become accepted and indispensable. Aunt Jemima and Bisquick are synonymous with pancakes because they’ve occupied that space for so long with very specific and direct messaging. Did you know pancakes are super easy to make from scratch? It’s just a few more ingredients than using a mix which is comprised of flour, baking powder, salt, and sugar. My bigger issue with processed foods is that we’ve forgotten how to cook from real ingredients. Our palates have become desensitized. I would challenge people to learn how to prepare a few of their favorite “fast” foods from scratch and reconnect with flavors that haven’t been dulled by salt and sugar. MR: You’ve taken a long, hard look at the past in American Advertising Cookbooks. What do you think the not-so-distant future holds in regard to the way edible products are presented and sold to us? CW: There has been a shift in awareness of the dangers of processed foods to fresher items. I do see a disturbing trend in companies that are marketing “fresh and healthy’” foods that are still pre-packaged, chemically extended, and honestly, not that great for you. The boom in packaged meal kits is concerning. They’re wasteful and still use some amount of processing to make the ingredients last longer. I’m guilty of buying bagged lettuce, which is the zenith of laziness and therefore entirely appealing to us. Why take 10 minutes to shred greens when you can rip open a bag? A few more deaths from food-borne pathogens will see these items fade from the market. MR: Is there anything else you’d like to say? CW: “Everything in moderation, including moderation,” said Oscar Wilde. I think it helps to be aware that there are and have been outside forces influencing our choices. Christina Ward’s American Advertising Cookbooks: How Corporations Taught Us To Love Spam, Bananas, And Jell-O is available now at Feral House Publishing and at Boswell Book Company. Join Ward at Boswell Books for an author event at 7 p.m. on Friday, February 1.